In this Very Short Introduction, the renowned philosopher Roger Scruton explores the concept of beauty, asking what makes an object—either in art, in nature, or the human form—beautiful, and examining how we can compare differing judgments of beauty when it is evident all around us that our tastes vary so widely. Beauty can be consoling, disturbing, sacred, profane; it can be exhilarating, appealing, inspiring, chilling. It can affect us in an unlimited variety of ways. Yet it is never viewed with indifference. 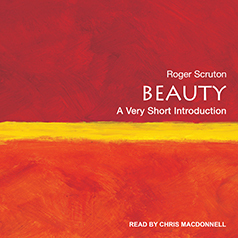 In this Very Short Introduction, the renowned philosopher Roger Scruton explores the concept of beauty, asking what makes an object—either in art, in nature, or the human form—beautiful, and examining how we can compare differing judgments of beauty when it is evident all around us that our tastes vary so widely. Is there a right judgment to be made about beauty? Is it right to say there is more beauty in a classical temple than a concrete office block, more in a Rembrandt than in an Andy Warhol Campbell Soup Can? Forthright and thought-provoking, and as accessible as it is intellectually rigorous, this introduction to the philosophy of beauty draws conclusions that some may find controversial, but, as Scruton shows, help us to find greater sense of meaning in the beautiful objects that fill our lives.